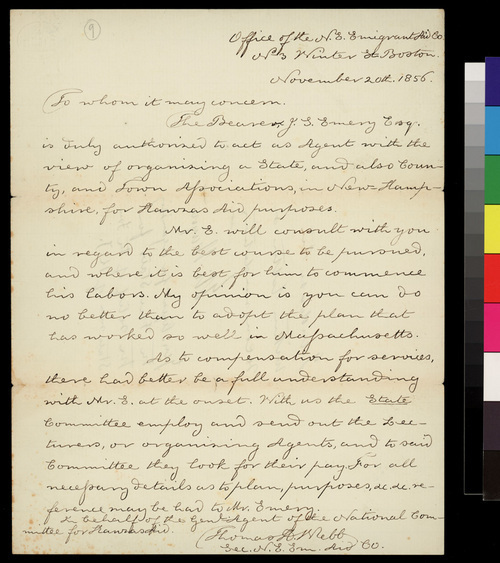 The letter indicatesthat J. S. Emery was duly authorized by the New England Emigrant Aid Company as an agent to organize state, county, and town associations in New Hampshire to provide aid to Kansas Territory. Webb suggests they follow the model established in Massachusetts. He also makes it clear that the state association would be responsible for paying Mr. Emery for his efforts in organizing New Hampshire.